Men on trial explores how the Irish perform 'the self' within the early nineteenth-century courtroom and its implications for law, society and nation. Drawing on new methodologies from the history of emotion, as well as theories of performativity and performative space, it emphasises that manliness was not simply a cultural ideal, but something practised, felt and embodied. Men on trial explores how gender could be a creative dynamic in productions of power. 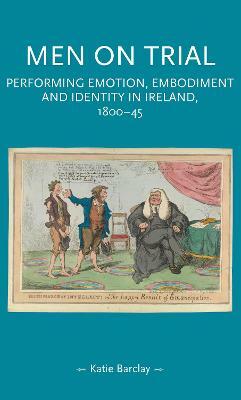 Targeted at scholars in Irish history, law and gender studies, this book argues that justice was not simply determined through weighing evidence, but through weighing men, their bodies, behaviours, and emotions. Moreover, in a context where the processes of justice were publicised in the press for the nation and the world, manliness and its role in the creation of justice became implicated in the making of national identity. -- . Katie Barclay is a Senior Lecturer in the ARC Centre for Excellence in the History of Emotions and Department of History, University of Adelaide -- .